it looks like a dumpster. And in a lot of ways it also functions like one. 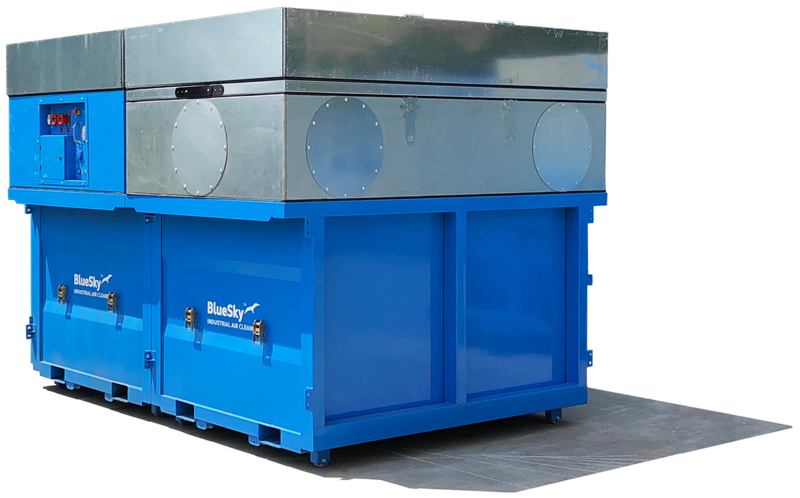 Many people seem to think that BlueSky only makes mobile dust collectors. That misconception is understandable. There is the low-profile design which makes you think of a mobile dust collector. The fact that there are no drums at the bottom might lead to the conclusion that there has to be an auger to remove the dust from the machine. Again, must be a mobile dust collector, right? No it isn't, it's a full-fletched fixed-installation, industrial dust collector for permanent use. Actually... it's both. Not only that, but it's a better mobile dust collector than anything out there, and it's also a better fixed-installation dust collector than any other industrial dust collector on the market. Bold claims? Definitely, so let's take a step back. A BlueSky dust collector has no hoppers or drums because it has a SmartBox module. And it has no need for an auger, for the same reason. The SmartBox (galvanized unpainted part) is the key to its dual-functionality. The SmartBox houses the filters and it's where the extracted dust is collected. The SmartBox is removed by your waste management company when it's full and exchanged for a new empty one. Now that's smart! You never touch the dust or change dirty filters, ever again. It's a revolutionary new way of handling dust in the workplace. 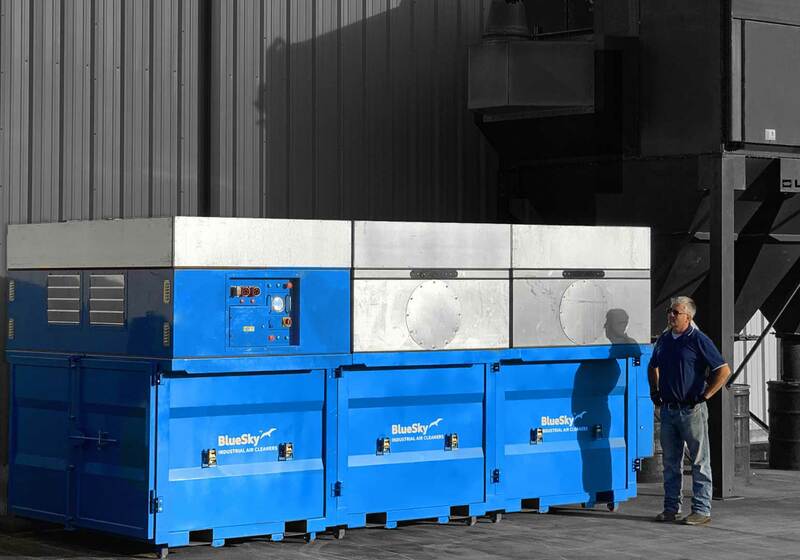 Most industrial dust collector companies offer some form of modular design, but BlueSky has reached an unprecedented level of simplicity with its new modular system. It takes only a few bolts to attach a new section. Each addition changes the machine's capacity and/or functionality. It's so simple, it often elicits the same reaction that our SmartBox concept does. "Why hasn't anybody thought of this before?" An industrial dust collector for fixed-installation use that can grow with you. Customized solutions and modular designs are offered by other dust collector companies, but what does it really mean? Well, it means you tell them how many SCFM's you need, the type of dust you're dealing with, the size of the space you need it for, and so on. Then they put their modules together and turn it into what will become your machine. And that's it, "customized" and "modular" stops at your front door. A BlueSky dust collector is different. Our machine remains customizable even after you take possession of it. This a huge advantage. You can get the dust collector that's exactly right for you at the moment you need it. No need to calculate the increased capacity the future may call for. No need to buy a bigger machine now, just to be on the safe side. The BlueSky dust collection system is truly modular and plug & play. Sections can be added and modules can be dropped in at any time. Your dust collector grows as your need for capacity grows. 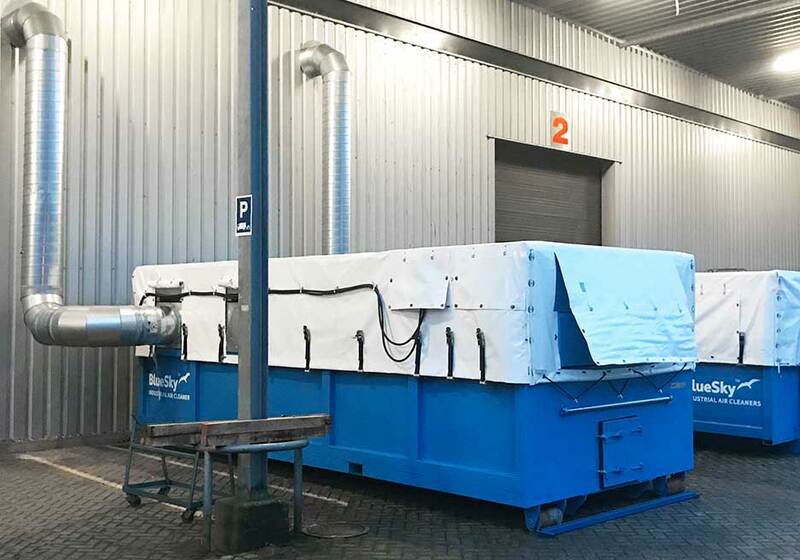 This on-demand-capacity feature of a BlueSky dust collector can result in substantial energy savings. 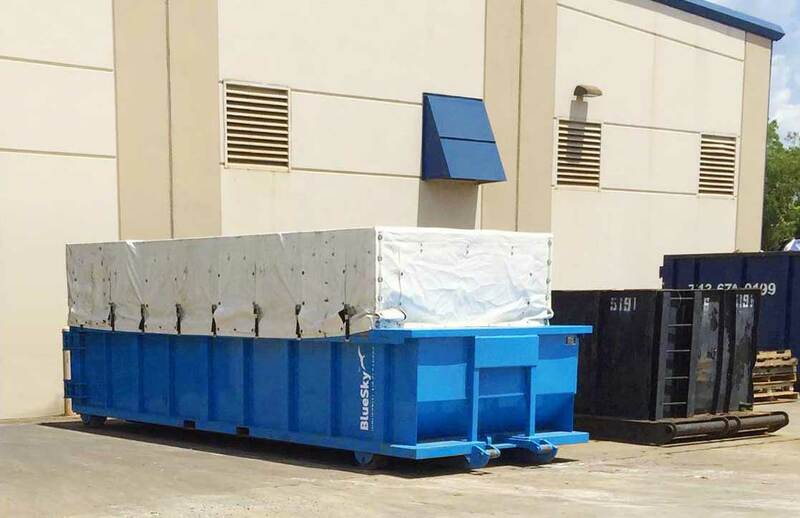 Examples of BlueSky industrial dust collectors installed as permanent solutions.